SWEDEN GUARDIAN for the modern defensive player who wants to be able to make offensive attacks to disturb the opponent and get important points. 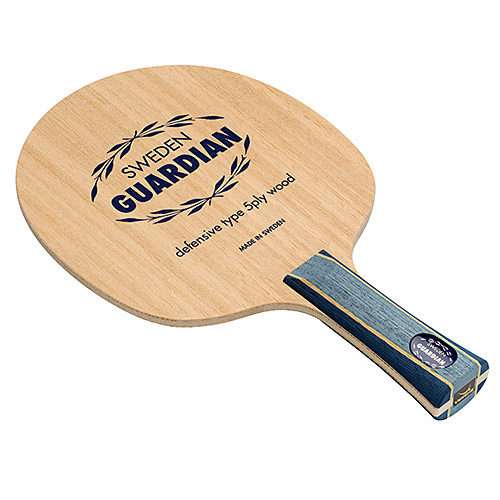 The blade SWEDEN GUARDIAN, produced in the famous blad factory in Tranås Sweden, is based on the classical Swedish allround construction famous for its good control and feel characteristics. However, this blade has two slightly harder inner layers and two slightly softer outer veneers. In combination with the special shape of the blade SWEDEN GUARDIAN offers interesting playing characteristics for modern defensive play. Laquered.